The first burbot I ever saw was preserved in a bottle of formaldehyde. It was the same monotone, gray-brown color of the dozens of specimens in jars that had come before it. I was unimpressed. It’s hard to have much feeling for something that smells that putrid and looks that bad. Not only that, I was cramming for an ichthyology exam and didn’t have time for the luxury of appreciation. A year or two later, I tagged along with a friend to check his burbot setlines on the Tanana River near Fairbanks. The first five sets were empty. The fish he pulled from the sixth ice hole caused me to take a step back. That wriggling and writhing burbot had little in common with the lifeless and stagnant variety housed in the jars of university collections. If I didn’t know better, I would say a committee composed of a wolf-eel, a blue catfish, and a bowfin got together to create the perfect fish – one that would reflect their best, albeit odd, physical characteristics. The wolf-eel insisted the head should be fierce like its own; a head and face that would cause humans to draw back in fright and repulsion. The catfish agreed a fierce look has its merits, but argued that too many fish have laterally compressed heads and he proposed the perfect fish have a flattened noggin with wide jaws to capture and hold large prey. The catfish was proud of his many whiskers and suggested the perfect fish have even more. The wolf-eel and bowfin were partial to their smooth, uninterrupted physiques and secretly thought the catfish’s whiskers to be rather silly and unrefined. After much deliberation a compromise was reached and it was decided the perfect fish would have only one whisker, a neat, distinguished barbel on the chin. The issue of tail shape caused great consternation. In the end the bowfin won, arguing that her guitar pick-shaped tail was the most useful for quick bursts of speed. While they were on the subject of fins, she insisted that no other dorsal fin would properly complement the adopted tail fin than a long, beautiful, uninterrupted mane like her own. The wolf-eel agreed, but the catfish, feeling slighted, argued for a break in the dorsal fin. Burbot are relatively unique among Alaska freshwater fish in that they spawn in rivers and lakes during the winter when the ice cover is at or about its thickest. This makes studying the spawning habits of burbot more difficult than studying those of more civilized fish that graciously spawn in spring, summer or fall. Still, we do know a bit about the spawning habits of burbot. Burbot are broadcast spawners, which simply means the females release their eggs into the water column and males simultaneously release milt. They do not build or prepare nests of any kind. Several to many burbot form writhing, twisting balls to spawn. Burbot that spawn in rivers do so a bit earlier than their lake counterparts. This is probably because the ice goes out earlier on rivers than on lakes, and it is advantageous for the eggs to hatch just around ice out, when phytoplankton and zooplankton (the food of the newly hatched burbot) are more readily available. Typically, burbot spawn over gravelly areas in rivers or lakes. The eggs tend to get caught in the small spaces between the gravel. Burbot eggs are only about the size of a pin head, and an individual female can produce over a million eggs. When young burbot hatch, they have a very small yolk sac that is quickly absorbed. The newly hatched fish are about the same specific gravity as water so they tend to move with the current until they grow large enough to work against it, at which point they may begin feeding on aquatic insects. Once big enough, burbot feed on smaller fish. Favorite foods include whitefish, Alaska blackfish, lampreys and the young of lampreys (ammocetes). When properly enticed, burbot are voracious predators and excellent fighters at the end of a fishing line. 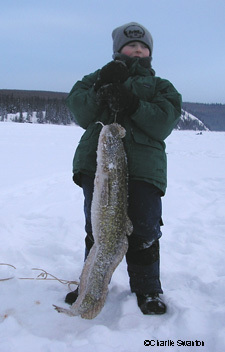 Most burbot fishing in the Tanana Valley takes place during the winter. The burbot is the poor man’s lobster for another reason other than taste. You don’t need a boat to access some good burbot fishing spots. All you need are snowshoes, skis, or just strong legs to reach prime burbot territory in the winter time. If you are a night owl, you are the perfect burbot angler. Burbot like to feed during the night. Don’t ask how they know the difference during the dark winter days of interior Alaska, but somehow they do. You’ll have more luck jigging for burbot between the hours of 10 p.m. and 6 a.m. You will also do better if you use fresh bait. Burbot turn their substantial noses up at freezer-burnt fare. Plunking a hook baited with fresh whitefish, lamprey, smelt, or herring through the ice is akin to ringing a burbot dinner bell. Just rig a large hook, of at least ¾ inch gap (even small burbot have big mouths) with your choice of bait. Jig the bait close to the bottom of the lake or river. Burbot tend to spend most of their time lying on the bottom in slow-moving water and backwater eddies. Two feet of water is deep enough to be home to large burbot. If you begin to nod off as the clock strikes ten, you still have an excellent opportunity to lay out a fresh burbot dinner for the family. Setlining is a legal method to harvest burbot in most waters of the Tanana Valley. Check your regulations for the waters in which you plan to fish. You can put out a setline during the daylight hours, let it fish through the night and check it the following day.